Give. Oh, my friend, you ate indeed a giver. Eight years ago you gave me your time and your kindness to help me through a difficult time in my life. Ever since then, you’ve been there for me, helping me on my spiritual journey. You are a gift. My word last year was adventure, but it didn’t turn out as I expected. But I did have adventures in my relationship with God, particularly when momma passed away. This year’s weird is DISCOVER. I want to discover more in the eyes, more about Him and our relationship. I think I’m off to a good start. Anna, has it been eight years? I can’t believe it. Your words bless me so much–they always do. Yeah, last year was quite an adventure for you, I’m sure. And you hung on tightly to God the whole way through. DISCOVER. I can’t wait to see what you discover this year! I love you too. I smiled (and exhaled a sigh of relief) when I saw your comment pop up this morning. It’s always my prayer that my posts are relatable. Oh Julie! 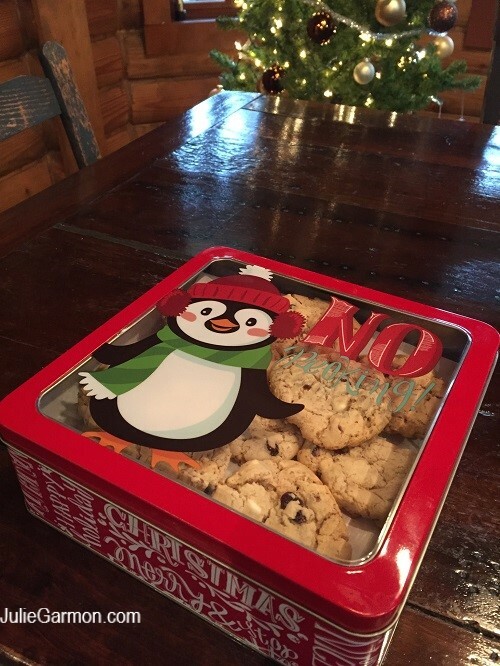 I love your cookie baking themed process for receiving your new word. I really enjoy baking and often share. My go to is muffins. My word for 2017 was Hope. Last year was a long and challenging year. One where I was reminded over and over again to reach out and cling to the Hope of Christ. My word for 2018 is again Hope. But with a different perspective. This year I feel led to live Hope, to be Hope, to offer Hope to others. 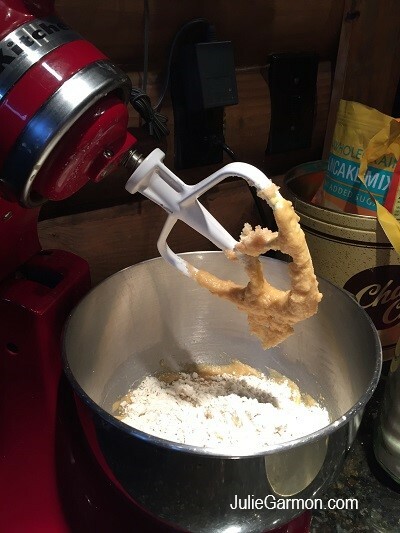 I am not fully sure what that looks like, or how that will play out, but your word and cookie idea are sparking something. Yes. The Broken Way. A life changing book, for sure. I read it when it first came out and then re-read it, slowly, with a pencil in hand. Powerful, impactful message. Hope–wow, that would make a good word for every year (and every day!) of our lives. I got a mental picture of you reaching and clinging to Jesus. Sounds like you’re feeling sort of what I’m feeling. I want to Give Hope to others. I can’t wait to hear where Hope leads you in 2018. Whew—The Broken Way. I think I want to listen to it too. I just have to put the book down in my lap and pause to absorb it. It’s so rich. Bet we could talk for hours about it! Much love my friend. Thanks for sharing your Hope with us! I knew cooking was considered an art, because you can experiment and create, while baking is viewed as a science, but I didn’t know or understand the why behind things. It was very interesting. 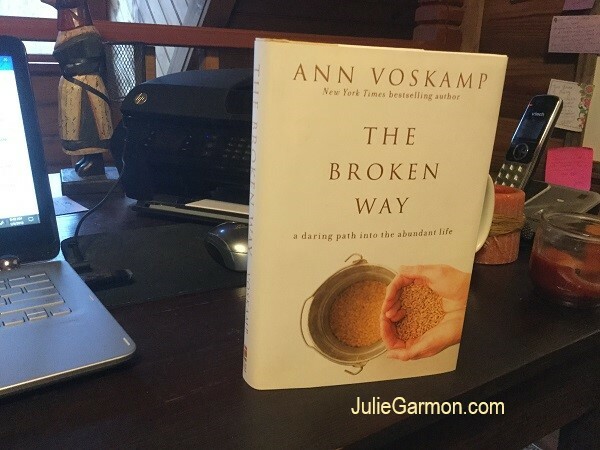 If you have the opportunity to listen to The Broken Way, or to do the Study, please do so. 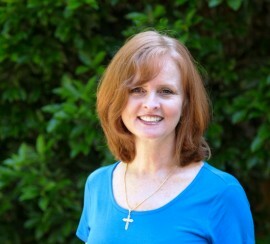 Ann Voskamp’s voice is so gentle, soothing, sweet. Plus, there are so many good things to pluck out of what she says that hearing again would be well worth it. I do want to listen–to what you sent me and to Ann’s Broken Way. I listened to her book, One Thousand Gifts a couple of times (and of course, read it too). Her voice is just so soothing, like you said. I didn’t know baking is a science. It feels like art to me. Listened to the cookie link. Very helpful! Thank you. I didn’t know there was a study to go with The Broken Way. Will have to check it out. I love your story of how God led you to your word!! My word last year was Called. This year, God led me to the word Enough. I’ve had the word Enough one year. Great word!!!! I’m smiling–so happy for you. Thanks for stopping by and sharing your word! Grace. Well, you can’t do better than Grace, can you? I love that word! Thank you so much for sharing it! This is so much fun for me–to hear everybody’s words. Dear Julie, Happy New Year! You GIVE words of edification! Past, Present, Future! You GIVE words that are daily Bread! My 2018 Word is JESUS………..the Center, the end all & the be all. In 2017 it was Surprise as in Surprised by the Spirit. I’m still discerning where that applied but am grateful for the surprise of a wonderful new girlfriend/helpmate for my divorced son, which is perhaps all I need from that Word! Yay! PS Thanks for not choosing “cookies” as it would’ve fed my sugar addiction for which I swear I need a Recovery program for! Thank you for opening with Give sentences! Jesus–wow–what a beautiful choice. Sitting here nodding. I love that you chose Jesus for 2018. Thrilled about the Surprise that happened in your family in 2017! 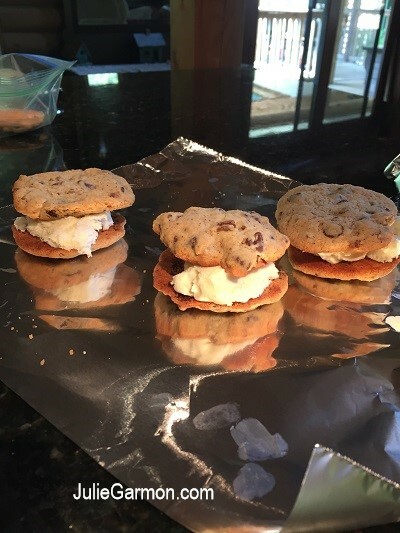 The cookies–I’ve learned to make them with Stevia. 🙂 Not sure if you can have Stevia, but they’re delicious. Keep up the good work with your Recovery! I love your word give. My word I had already told you is Strength thru faith and love.. I have in the past 6 months starting sending greeting cards to people. God seems to let me know who needs a card. My mother-un-law used to do that. It gave her great pleasure to send them out. Now I know the feeling. People and friends tell me they love getting them. I have had a very bad 2017 physically but I was able to send out cards. I believe with my whole heart gave me this to help me stay connected to outside world. When I started trying to find my word I kept reading seeing the word strength. I am almost fully recovered from things of this year. I still have a few more surgeries to go and I know my faith from God and thee love of my great caretaker husband will give me strength for the coming events. Julie you GIVE to all of us everyday, thank you and keep on baking. I had no idea you had a tough year. I’m so sorry. I do sense Strength in your comment. I really, really do. I absolutely LOVE your card idea. In fact, I have a good friend who makes cards. She invited me to her house one day last year and taught me a few things. I let the idea fade into the background, but I’m drawn to it–the creativity, colors, words–and of course, it’s a gift from your heart. I hope you’ll post pictures of your cards in 2018! May His Strength fill you with Hope and Healing and everything you need for the New Year! Julie, thank you for this post. I’ve still been searching for my One Word, and when I read yours, my heart raced. I’m going to be praying to see if that’s my word! Yay, yay, yay, Missy!!! Wouldn’t that be neat–if we shared the word GIVE this year? I’d love to!! Thank you for reading–and for letting me know it meant something to you. I love GIVE. It’s so you. 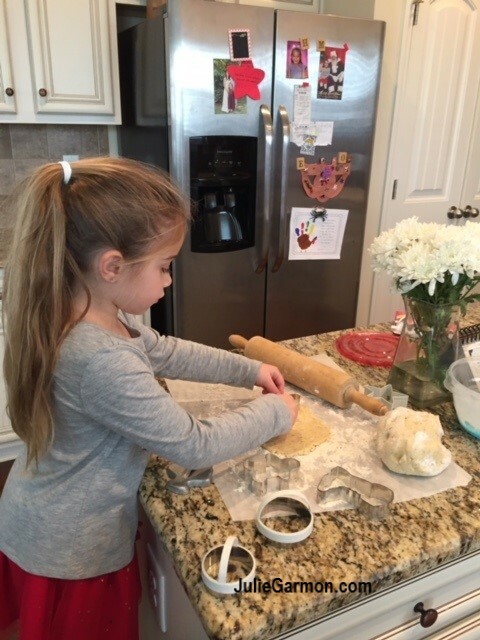 Making cookies is one of the ways our family shows love, too. At our reunions I often bring all of the ingredients for making cut-out sugar cookies with buttercream frosting and all the colored sprinkles to decorate the tops. It’s a fun family event that everyone gets into. My word this year is PRESENT. Being present in the moment. Giving a present to others whenever possible…sometimes that’s just my time and other times it is a physical gift. The present is a gift I give myself as well, of love, time, care. And the best present of all is living in the present. Warm hugs to Georgia Cookie Girl! Oh, yes! I remember you telling me about your sugar cookies! I get so excited when I think about this, B.J.—-think of the possibilities. Sugar cookies for every occasion! 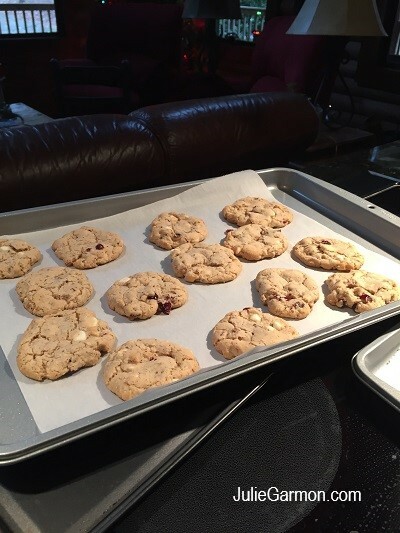 Valentine’s Day, Easter, Thanksgiving…..
For some reason, when I’m baking cookies, — I just thought of this– it helps me stay in the PRESENT. It slows down my mind and lets me love the moment. Thank you. 🙂 Your word gave me a gift! You’ve a very special present–a Gift from God, in my life. I will always be grateful for the Guideposts contest in 2004. 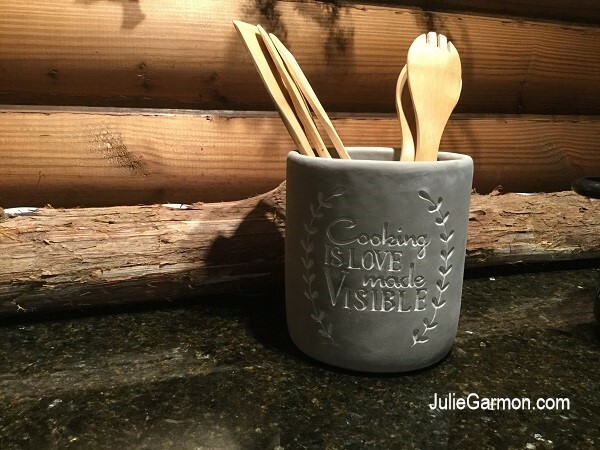 Wow, Julie, I think Pat Garczynski’s comment says so much, transferring from your past words – from SIMPLE to LOVE to GIVE: “You GIVE words that are daily Bread!” Holy goosebumps, for sure! As for my word-of-the-year, I won’t bother re-explaining the past three words, because I looked back at my comment on your post from January 2017, and it spells it out completely. I will catch you up a bit. Last year’s word, REDIRECTION, was perfect! The Spirit redirected me in numerous ways: in my relationships, in my health, and in my teaching and writing. First, I began a year-long focus on my husband and our love story, culminating with writing a piece for Chicken Soup which I’m praying will be accepted, a fun story about how we met. Over advent, I wrote a note-a-day on a magnetic pad on the front door, little things I was blessed by through him. When Christmas came and I stopped, he asked me why. I didn’t even know he read them for sure! So, I got another note pad and began anew with a prayer-a-day for January and other ideas building for the rest of the year. And this year’s word fits this new direction! For my health, I began working with a health coach through our insurance company at no cost to me. We chat about various topics of concern to my overall health, which has redirected me to look deeper at my physical health in direct correlation to my emotional/mental/spiritual health. I don’t have the answers yet, but again, 2018’s word will bring it for sure! And last, teaching/writing… You know through our dialogues how much I want to write for Him and how He has been working but still holding me off. Well, this year, He helped me see the need to redirect my constant need to teach to a renewed desire to teach through writing. Several things happened toward the end of the year which have left me with an unnatural positivity towards a publishable career in writing, including work on a couple requested book proposals. I know that I know He has plans for me this year, plans that will blow my socks off! And so, with complete trust in the Sprit’s guidance, I finally take the word NOW! as my word-of-the-year for 2018! To top it off and settle any doubts, during the week before Christmas, I was driving and thinking on this whole thing, wondering if I picked wrong, again, if maybe there was another word as in past years that I’d missed in my desperate hope to find the right one. I almost shouted aloud, “Lord, what is supposed to be my word for this year? !” Immediately, the radio announcer said…almost commanded…, “NOW!” I don’t know what his purpose was, but I know what was HIS purpose! There’s so much richness in your post. Yes, you and I have emailed back and forth about your writing. 🙂 Seems like the Lord is up to something (isn’t He always!) I can’t tell you how much I love what you did with the note-writing and your husband. This is so inspiring! Love, love, love it! It sounds to me, like what you did for him is sort of like our daily porch parties. So intimate. Such a good thing to do. And look–he liked it! I had no idea you can have a health coach through an insurance company. Wow! Sounds like she’s good at what she does! That’s awesome. The word “NOW” just charges something up in us, doesn’t it?! It’s a word full of faith. It’s fearless. And to live in the NOW, we must stay so very close to Him. I’m thrilled for you, for this year, right NOW! Thank you for giving part of yourself with your writing. It is uplifting and inspiring. My word is CHOCOLATE. Okay, not really, but it should be. I chose HOPE…but keep getting nudged with gratitude as well. My wife and I had a bit of a rough 2017 – mostly with neurological issues with her. She had blood work, an MRI and EEG done, and then a long psychological test. The neurologist said the blood work, MRI and EEG were good, but said the test results indicate she would have late-stage dementia, not be able to function and should be in a home (she is 48). Through LOTS of prayer and faith, we prayed it would not be that. After talking with her, he diagnosed her with depression, anxiety and possible PTSD (she was a Marine for 24 years). He has her on medication and wants her to see therapist (she is talking with one now as I wait outside). Our hope is in Him. And we are thankful for His goodness and love. She seems mostly like herself, but needs confidence and joy again. I’m with her every step of the way. This all made me take a back seat somewhat with my writing, but God is nudging me to continue to write and to share His goodness. I TRY to do that with my books (mainly fiction) and photos (I recently finished a photography book with some of my favorite verses). Thank you for giving of yourself and inspiring others! I can hardly breathe….wow. There’s so much in what you said. You and your wife are in the middle of the battle and you’re praising God. I can feel His Spirit in your words. So. Much. Hope. No matter what kind of hope. You’re staying True and Faithful and leaning on Him for strength. The depression– I’ve been there. Twice. My heart hurts for her. There is Light, even though at times it’s so dark when you’re there. It’s a trapped feeling of fear and horrific sadness. I’m praying for her. Both times it hit me, healing was so very daily. A process. But thank You, Lord, healing DID come. I’m praying about your writing. Sometimes our best writing comes through pain, as I’m sure you know. At times, writing has been my sanity. Congratulations on your photography Scripture book! That’s great news. You wanted to pick Chocolate and I wanted Cookies. 🙂 But we can’t leave it there, can we. We gotta go deeper–to grow. To survive. I’m praying for both of you. Thank you for sharing a little peek of your heart and your world with all of us. It’s an honor. And please thank your amazing wife for her service. Lord, bless her and keep her. Shine your face upon her. Bring Hope and Healing. Give Kevin supernatural Strength as he perseveres. Oh the fun of autocorrect! Marci’a and I were recently talking about easy bake ovens, is what I meant to say! Leafy, my mind autocorrected. I knew what you meant. I can’t WAIT to find out your word. Can you believe you chose Heal last year?!! God is so good to us. It means so much that you and Marci’a are friends. You are both so special to me–and to know that God stirred my heart to start a blog, and two readers connected–from across the miles. Thank You, Lord. It’s all YOU. Will You help my friend Julie choose just the right word? Will You speak to her heart? Thank You for being there for her last year in such a mighty way. We Love You! I’ve come back twice to read and re-read your love-filled words. I found such comfort and warmth in them- I needed to visit them more than once. I was trying to guess your word as you gave clues, and I thought “bake” might be the word for a few seconds! Ha! I have such fond memories of baking too. I longed for an Easy Bake Oven when I was young, but alas, it wasn’t meant to be. I took great pleasure in buying one for my niece who loves to bake and hope she’ll have fond memories from that toy. I love how you share the process of how your word found you! 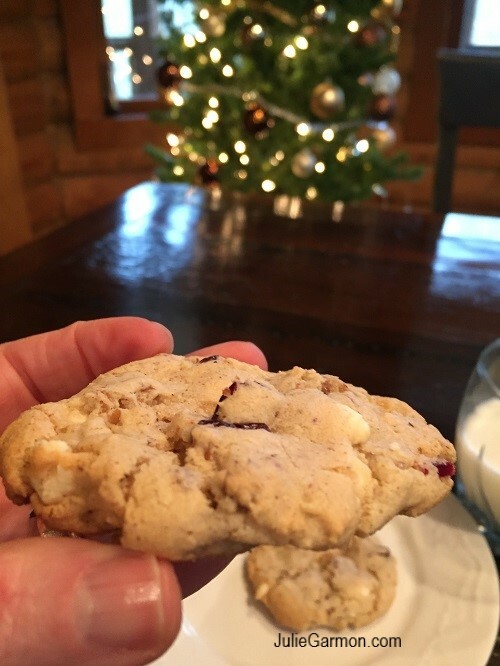 I can’t wait to see all the ways you discover how to give, and what to give- cookies is a great way to celebrate the word give. I have great hope for you and your new found ministry to give even more of yourself! Blessings and love to you! Someone else thought the word was “bake.” That never occurred to me but what a neat idea. If you and I’d grown up in the same neighborhood, I’d have shared mine. It was definitely a process to get this word. I find myself being drawn to new cookie ideas and recipes. It’s just plain fun to allow myself to enjoy something I loved so long ago. Thank you for understanding the emotions that went behind my word choice. I am so glad I was finally able to see your blog. Wow, again! It goes strait to the heart. God inspired for sure. And I think when I am here– with you, how much you GIVE already, and you are the reason we are all here, and can join hands across the miles. And I think, because of your giving, — Surley the Lord is in this place! He truly is. My word for this year seems to be BE. I am not sure where that will take me, but it should be an interesting journey. The other word that seems to jump out ot me (or words) are Light, and Abide. Yes, when you said Easy Bake Oven, I remembered how Julie had just mentioned having one and what joy she had making little cakes with it, fond memories. Right now, we are having phone problems again, so I am hoping this will post, and I will be grateful for that gift. Broken– right now the phone lines are broken. That seems to also be a word that keeps popping up. I will look for that book you mentioned. I saw a book, Broken By Ryan Casey Waller. It says, “Before Jesus broke the broke the bread he blessed it.” and …”pouring out our brokeness, not just to God, but to each other. “, Both of these books on Brokeness, sound so good. I want to read them both. Now, with a prayer I will try to post. God Bless dearest Julie, Thank you for being here! and letting God use all you go through , lessons, to help us all in this journey. Yay! Your comment posted. Hope your phone issues are fixed for good! BE. I really love your word, Marci’a. Reminds me of a bracelet my BFF gave me years ago that said, “Just Be.” Your two-letter says a lot, doesn’t it? I’ve never heard of the Broken book you mentioned. Sounds good. I’m always learning so much from y’all. Great big hug to you tonight, Marci’a. You’re such an encourager to me. I sooooo appreciate it! Dear Julie, what joy for me to catch up on your posting, it’s like reading a book just for me. may years ago your Mom ministered to me through her writings, never ever did I think her daughter would be doing the same! God is so good, all the time. 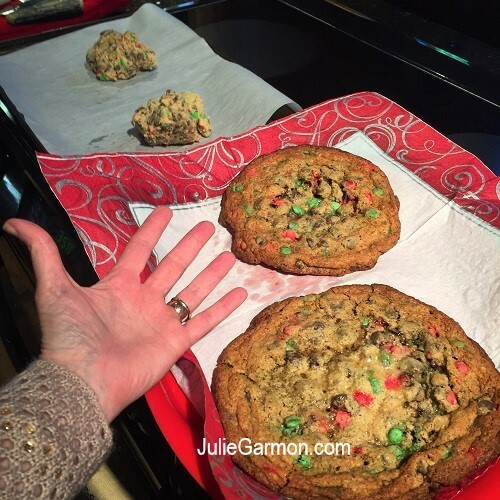 I love to bake too, especially cookies, this year I baked over 100 dozen cookies and gave many away as gifts, and felt as you did about giving, because I knew that the secret ingredient in them was “love”! Your word for this year is perfect, I am still searching for mine, and like you am praying for the Lord to show me or take the desire for it away. Thank you for being you and for loving us, your readers! Wow—we’re soul sisters!!!! And you made 100 dozen cookies! That gives me something to shoot for. 🙂 I already know two friends I need to bake for. Did you ever mail cookies? I need to figure out how to do that, and hopefully, I won’t be sending cookie crumbs. Your note meant so much to me. You “get” me. Let me know if you discover your word. I’m saying a prayer right now that you will. What a beautiful post, and a great word. You are so generous and giving in your blogging and other writing. Thank you for being open, genuine, and loving. I chose a word for the year for the first time 2 years ago after reading your post about choosing “Dance.” I had read of other people doing this as a way to add discipline and reflection into their lives but had not done so myself. Last year’s word was “Grace” and I really rested in it as I’ve lost my job and have become ever more present to God’s gifts. Thanks to your readers for their comments too! It is so encouraging and a privilege to get a glimpse into your lives. There is so much love, hope, and positivity on these pages! I have a feeling you will LOVE the word LOVE—just like I did. Makes me smile that you chose a word after reading my Dance post. 🙂 I’m so sorry you love your job—what a good year to have chosen Grace. Now, I’m going to read your post! Blessing, and thank you for all the kind words. I feel the very same way about you, Patricia. And our prayer team is praying for you and your family.